Game cartridge includes a photometric light sensor that measures the amount of sunlight exposed to it. In order to charge the in-game weapon, the player must actually take their Game Boy Advance outside in the daytime (as verified by the light sensor). If the player's gun runs out of light reserves and there is no sunlight available, then the player must avoid enemies. Since the sensor on the cartridge picks up UV light, it is possible to use a black light in order to trick the game into thinking you're exposing the cartridge to sunlight--this is an alternate way to continue progressing through the game when the sun isn't out. Box Text: Solar Powered Fun! 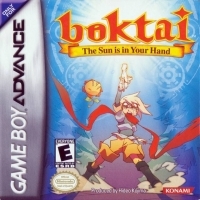 From the creator of the Metal Gear Solid series, comes Boktai The Sun Is in Your Hand, the first game that requires players to step outside into the sunshine! 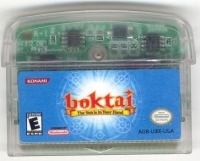 Boktai uses breakthrough solar sensor technology, letting players harness the power of the sun to fight vampire! 04-16-2019 silverbow Description Cartridge ID: AGB-U3IE-USA Game cartridge includes a photometric light sensor that measures the amount of sunlight exposed to it. In order to charge the in-game weapon, the player must actually take their Game Boy Advance outside in the daytime (as verified by the light sensor). If the player's gun runs out of light reserves and there is no sunlight available, then the player must avoid enemies. Since the sensor on the cartridge picks up UV light, it is possible to use a black light in order to trick the game into thinking you're exposing the cartridge to sunlight--this is an alternate way to continue progressing through the game when the sun isn't out. 04-15-2016 mrfoxhound Box Text Solar Powered Fun! From the creator of the Metal Gear Solid series, comes Boktai The Sun Is in Your Hand, the first game that requires players to step outside into the sunshine! 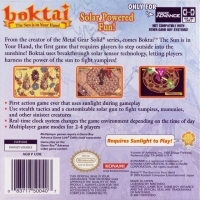 Boktai uses breakthrough solar sensor technology, letting players harness the power of the sun to fight vampire! • First action game ever that uses sunlight during gameplay • Use stealth tactics and a customizable solar gun to fight vampires, mummies, and other sinister creatures • Real-time clock system changes the game environment depending on the time of day • Multiplayer game modes for 2-4 players Requires Sunlight to Play! 04-15-2016 mrfoxhound Description Game cartridge includes a photometric light sensor that measures the amount of sunlight exposed to it. In order to charge the in-game weapon, the player must actually take their Game Boy Advance outside in the daytime (as verified by the light sensor). If the player's gun runs out of light reserves and there is no sunlight available, then the player must avoid enemies. Since the sensor on the cartridge picks up UV light, it is possible to use a black light in order to trick the game into thinking you're exposing the cartridge to sunlight--this is an alternate way to continue progressing through the game when the sun isn't out. 12-11-2015 silverbow Description Game cartridge includes a photometric light sensor. This is a list of VGCollect users who have Boktai: The Sun Is in Your Hand in their Collection. This is a list of VGCollect users who have Boktai: The Sun Is in Your Hand in their Sell List. This is a list of VGCollect users who have Boktai: The Sun Is in Your Hand in their Wish List.